Let me tell you the story of a watch, and help illustrate a peculiarity of this hobby in the telling. In 1957, the world was optimistic. World War II had ended, atomic energy and jet engines were on the rise, and it appeared that science and technology could accomplish anything. Why, in a few years mankind might even reach space! It is against this backdrop that 66 countries, including the United States, the Soviet Union, and all of Europe, declared a year of science, the International Geophysical Year. IGY was marked by exploration of the Antarctic, ascent of the tallest mountains on earth, and progress towards exploring space, especially using radio astronomy. People everywhere celebrated these achievements, and the wealthy citizens of the first world began buying high-tech devices for their modern lifestyle. Watches, especially precision Swiss chronometers, became a must-have accessory for the modern man. And the Swiss watch industry was ready and able to step up and meet demand! 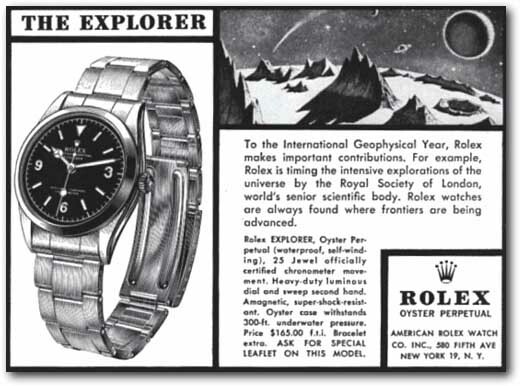 Rolex was tremendously successful in tying into the Hillary/Norgay Everest expedition, advertising the connection to their Explorer watch. Another model connected to the IGY is the famed (and highly-desirable) Jaeger-LeCoultre Geophysic, which was actually more of a competitor for the Rolex Milgauss. 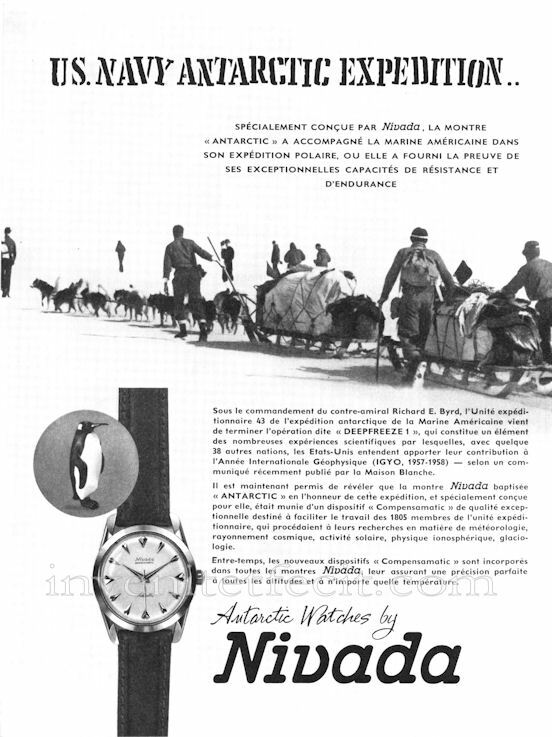 Other watch companies joined in as well, supporting mountaineering and Antarctic expeditions and using this connection in advertising. Vulcain was involved in the ascent of K2, for example, and Enicar went up Lohtsé. One company that went all-in for explorer-connected watches is Nivada, yet they are all but forgotten today. Once a major Swiss watch company, Nivada was early to bring an automatic watch to market, enjoyed success in chronographs and dive watches, and produced a successful line of chronometers. Yet Nivada was unable to sell under their own name in the United States after the threat of a name-similarity lawsuit by Movado. They added their home town of Grenchen to the dial and struck a deal with the Croton watch company for distribution. So these watches are often known today as “Nivada Grenchen”, “Croton Nivada”, or just “Croton”, if they are known at all. In time for International Geophysical Year, Nivada supported the US Navy “Operation Deep Freeze” with a durable waterproof, anti-magnetic watch they named “Antarctic”. 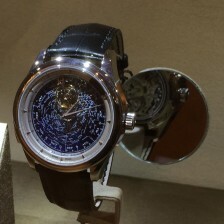 This would become one of their signature products, alongside the solid Chronomaster chronograph line. The first Nivada Antarctic watches were simple three-hand watches but with surprisingly attractive cases, faces, and icicle-style polished markers. Later Antarctic watches gained date complications and, in the 1970’s, increasingly avant-garde cases. But, like so many other great Swiss watch manufacturers, Nivada failed in the face of quartz and is now a marketing brand relegated to the Mexican market. Today, it seems laughable to think that a Nivada would be worth the same as a Rolex or Jaeger-LeCoultre. And vintage watches from IWC, Breitling, Zenith, and Heuer retain much more value than the products of Universal, Buren, Vulcain, or Enicar. Yet these brands (with the possible exception of Rolex) were all fairly competitive when these watches were new. It seems that a brand’s value is based in large part on their credibility and popularity today. Rolex has remained strong and Jaeger-LeCoultre is enjoying a resurgence of interest. Although the Nivada, Buren, Vulcain, and Enicar brands can be found today, they are anything but prestigious. And this has reflected on the valuation of their historical products as well. It’s not all marketing, however. 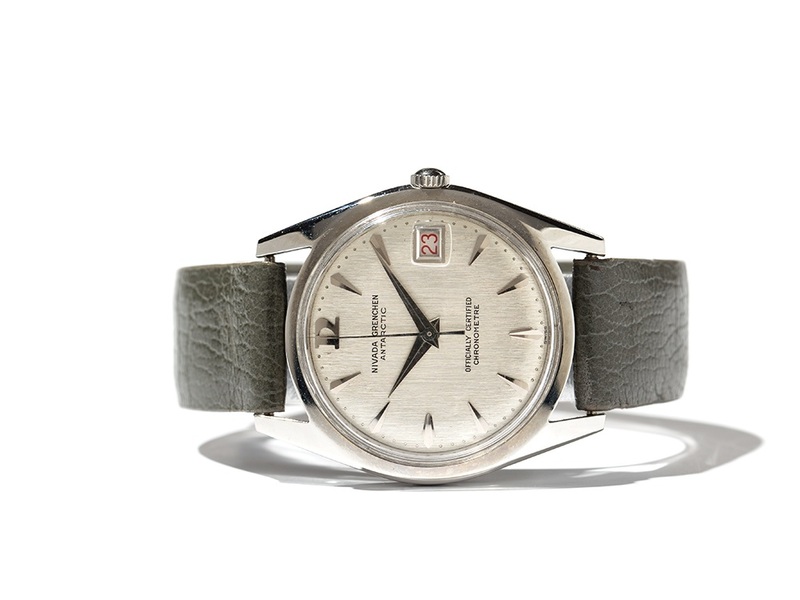 Rolex and Jaeger-LeCoultre in particular have a strong reputation for support and service, giving vintage pieces a new life and buyers peace of mind. But the etablisseur culture of the Swiss watch industry in the classic period means that most of those movements remain serviceable. I’m sure a competent watchmaker would have no trouble with the ETA 2472 in my Antarctic even if the original maker is long gone. This pattern is remarkably predictable. Watch an auction and notice that brands that remain credible and popular today (even those with interrupted histories and dubious reputations for service) sell for far more than the once-great brands who have faded or disappeared. And this presents an opportunity for those of us who are willing to look beyond fame! Stephen – good article, really appreciated. I recently ‘discovered’ Nivada and have already acquired 3 Leonardo da Vinci models. I’m now looking to specialise on this model and build a database of variant types. Now going to enjoy browsing the rest of your site.